Xander Bogaerts was atop (or near the top) of a lot of fantasy sleeper lists before last season this year, he's simply near the top of the fantasy shortstop list, period. Now, to be clear, if you're looking for consistent, reliable power, Bogaerts is not your guy. Similarly, if you're looking for consistent stolen bases, he's still not your guy. There's a significant drop off in the traditional, 5x5 fantasy stats when you compare Bogaerts to Correa and Tulowitzki, especially, although Bogaerts has the potential to significantly out-perform #3-ranked Francisco Lindor and #5 ranked Ian Desmond if he plays his cards right. Xander Bogaerts can be counted on for another 80+ Runs in 2016, and he can also be counted on for at least 10 HR as well, at least we think so. He showed 15-20 HR power in the minor leagues; He hit 12 HR in the majors in 144 games in 2014 (vs. just 7 in 156 games last season). You can also count on some pretty clutch hitting from Bogaerts as well. Any guy who manages to drive in 81 RBI with just 7 HR is a reliable, contact hitter when it matters most: with runners in scoring position. In 2015, Xander Bogaerts his .331 with runners in scoring position. On top of that, when he was moved into the 3-spot in the lineup, he hit .341 (116 Hits for 340 AB in 50 games). While everyone else is healthy in the lineup, don't expect him at the #3 spot, but as soon as the injury-prone usuals in Boston start hitting the DL, look for Bogaerts to step up his game - with some additional power, even. 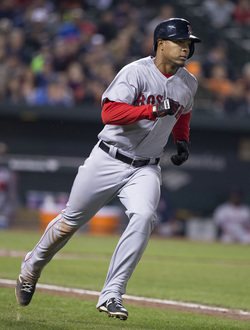 Xander Bogaerts' .320 average and 81 RBI with just 7 HR was impressive. We expect more HR and an average around .290-.300 in 2016. *81 RBI with just 7 HR indicates that Bogaerts is a clutch hitter, especially with runners in scoring position. *HR totals in the minors and in 2014 indicate we can expect 10-15 HR out of Bogaerts in 2016. *His .320 batting average is a little askew; expect a drop to the .290-.295 range. Anything above that is gravy. *32 walks is very low for 156 games, but 101 strikeouts is also relatively low for a 22-year-old. Expect about the same walk-to-strikeout ratio this year, but he may add 10-15 to each.